Not much crafting has been taking place around here these past few days, but there has definitely been a lot of baking! Unfortunately it's nothing exciting...just a lot of banana bread. A lot. Both Brett and I have been bringing home bunches of bananas without realizing that the other has bought some, and so there is a plethora of bananas in the house. As much as the Munchkin loves bananas, there's only so much he can eat. 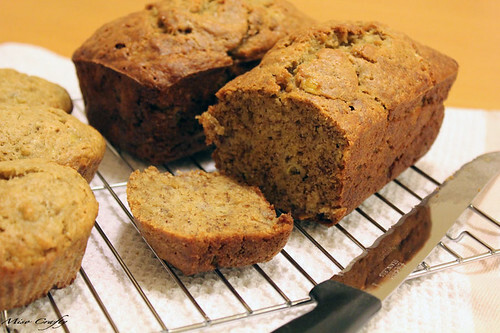 So what do you do with overly ripe bananas? Why, you make bread, of course! The first batch I baked I used these little diamond-shaped silicon cups that I got for Christmas, which produces the perfect little nuggets for little toddlers to munch on. Or, to scarf down in 2 bites if you're an adult (coughBrettcough). That first batch had last not even a full day and the Munchkin was all disappointed the next day when he woke up to find all the wee breads were gone. So Mama to the rescue and another batch was quickly whipped up. With help from the Munchkin, of course. And by help I mean he rested his hand on mine while I used the hand-held mixer and then he slobbered over the side of the bowl (to get as close as possible) when I switched to stirring with a wooden spoon. This last batch is almost gone but I'm sure I'll be baking up another round in the next day or two. I've been using my Mom's recipe and halving the half recipe (she normally bakes about 6-8 loaves at a time). But the recipe on Mae's blog is pretty much spot on to my Mom's. I'm really hoping that I'll be able to get back into knitting again soon. I was playing around with the Munchkin a few days ago and while he was holding onto my right index finger he fell awkwardly, causing my finger to twist in a weird way. Now my finger constantly hurts and it's making knitting slightly uncomfortable. I was also hoping to get some sewing done this week but realized that my supply of fusing has been reduced to scraps...and trust me, fusing is one of those things that you just don't try to patchwork together. Hopefully I can re-stock my supply this weekend and get sewing while I have the urge to do so. In the meantime, I'm going to eat a slice of banana bread. Banana bread! OM NOM NOM!